In October 1915 Messrs Tilney had the old Pavilion Theatre, Abertillery fully reconstructed, the walls, stairways and staircases were made from reinforced concrete, making the whole building practically fire-proof. The main mall was moved to the Glandwr Street side. On the far side the steps lead down to the left towards the shilling and six penny seats, while to the right was the entrance to the lower priced seats. Description of the New Building. In the centre of the hall was a fine staircase leading to the balcony where the seats were 9d. The boxes were set with moulded plaster fronts of cupids and flowers decorations, the roof was also finely decorated with artistic plaster-work and was 44′ feet high, enabling the curtains and scenery to be raised and dropped without the need to be rolled. Another feature of the Pavilion Theatre was a dual heating installation, the radiators could be turned off in the auditorium while the stage and dressing rooms were still given warmth. The scenery was exceptionally fine and was designed and created by Mr J. Leas the Pavilion’s Scenic Artist. The Pavilion Theatre also had its own electricians, being Mr J. Cross and assistants. On Monday March 6th 1916 the new Pavilion Theatre, Abertillery was opened to the public. Mr Arthur Tilney secured the exclusive rights for the new Pavilion Abertillery to show the famous Charlie Chaplin films. 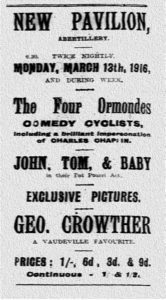 On Monday 13th March 1916 twice nightly and through the week the artists were “The Four Ormondes” a comedic cycling troupe, they included a “Charles Chaplin” impersonator; “John, Tom & Baby” a pot-pourri act; “George Crowther” a vaudeville favourite: In between acts exclusive pictures were shown. There was a long held belief that Charlie Chaplin had appeared at the Pavilion Theatre, Abertillery and the rumour spread from word of mouth, the belief was not only held but strongly defended by the locals that the great “Charlie Chaplin” had indeed visited Abertillery. I have researched this to the death and found no proof what-so-ever that he did appear at Abertillery. In my opinion the rumour came from the fact that there was a Charlie Chaplin lookalike impersonator performing the week after the official opening of the Pavilion Theatre in March 1916, as seen on the ad (right) and that they were exclusively showing his films, someone must have walked home and said to his or her family “I just saw Charlie Chaplin in the Pavi!” and the rumour started from there. Even though Fred Karno’s troupe came to Abertillery on a few occasions during 1908, Charlie Chaplin was not a player at this time. Later Charlie Chaplin joined the company and did a small tour of South Wales but a venue at Ebbw Vale was the closest the troupe came and even though Charlie Chaplin was in that troupe there is no evidence he appeared on stage (further information can be found in an excellent book titled “Chaplin – Stage by Stage” by A. J. Marriott). Later in the 1920’s Mr Fred Karno once again came to Abertillery and did shows in the Metropole in 1925, though by this time Charlie Chaplin was in the U.S.A.